Browse our Slate FAQ for answers to the most common slate roofing questions. If you have additional questions or concerns, please feel free to Contact Us and we will do our best to provide the information you are looking for. 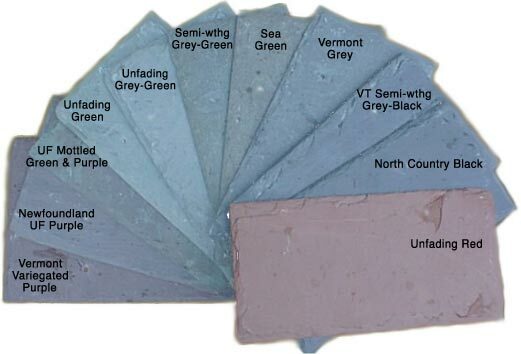 How many slate colors are there and what are they? What are meant by the terms weathering, semi-weathering, fading, and unfading? Where does brown slate come from? How much of the slate shows? What is headlap and why is it important? How thick is roofing slate? How do I determine the number of squares needed? What tools do I need to work with roofing slate? How is slate fastened to the roof deck? Q: How many slate colors are there and what are they? Q: What are meant by the terms weathering, semi-weathering, fading, and unfading? Unfading slate is slate which changes very little from its freshly quarried look and whatever changes do occur are relatively uniform throughout the roof. If slate isn’t unfading it is known as “fading” (also “weathering” or “semi-weathering.”) The amount and type of fading or weathering varies from color to color and quarry to quarry. A reputable supplier can usually offer a fair prediction of the weathering characteristics of their slate. Fading and color shifts do not affect the longevity of top-quality slate, but will affect the appearance and thus should be anticipated. Q: I’ve seen roofs with brown or rusty-brown slate. Where does brown slate come from? Brown slate is not brown when first quarried. Brown slate occurs in “weathering” or “semi-weathering” veins and after exposure to the elements. Which slates are destined to turn brown and which are not is not readily apparent (it takes a few months of sun and rain), so if brown is not a desired color in the finished roof, then “unfading” slate should be specified. The percentage of brown that will occur in “weathering” and “semi-weathering” slate will vary from quarry to quarry with some deposits turning almost 100% brown and others as little as 10%. Knowing the weathering characteristics of the stone you’re using makes good sense and avoids unpleasant surprises and misunderstandings. In addition to natural forms of weathering, slate can be discolored by any number of environmental factors including tree sap, rusty roof metal and airborne pollutants. Q: What sizes of roofing slate are available? Often asked and a very good question. There are 36 common slate sizes (give or take a few). Standard lengths are 12″, 14″, 16″, 18″, 20″, 22″ and 24″. Standard widths vary somewhat depending on the lengths. The narrowest common width is 1/2 the height (for example: 12″ x 6″, 14″ x 7″ or 16″ x 8″). 13″ dimensions are traditionally avoided, presumably out of superstition. Aside from the standard slate sizes, you usually are able to have other sizes specially made, but most producers will demand a premium for deviating from standard production. There are limits, of course, but we have seen roofing slates as large as 30″ x 24″ and as small as 9″ x 6″. Q: How much of the slate shows? The portion of the slate that you can see, (not buried under succeeding courses) is referred to as “exposure”. Exposure is dependent on the headlap and calculated by: (length minus headlap/ 2). For example, an 18″ tall slate will have an exposure of 7-1/2″. [(18″ minus 3″) divided by 2] = 7-1/2″. Q: What is headlap and why is it important? Headlap is simply the portion of the slate that is overlapped by two layers of slate (from the next two courses). Say what? Headlap is what makes the roof watertight. Standard headlap is 3″ and should be adhered to unless the pitch is very steep (greater than 20/12), in which case you can reduce headlap to 2″, or very shallow (less than 6/12), in which case headlap should be increased to 4″ as moisture will not shed as readily. Further adjustments to headlap are sometimes made based on climate. (wet or dry) and prevailing winds. It should be mentioned that under no circumstances should the installer try to “stretch” the slate by “cheating” on the headlap. DEVIATING FROM THE RECOMMENDED HEADLAP CAN HAVE CATASTROPHIC RESULTS!!! (like water damage or, if it’s a commercial job, water damage followed by lawsuits). DON’T BE TEMPTED. Q: How thick is roofing slate? Standard thickness roofing slate is usually defined to be 1/4″ nominal thickness or about 3/16″ – 5/16″. The experienced eye of the splitter is the primary thickness gauge, and thus that 1/4″ thickness will usually vary by at least 1/16″ in either direction. It’s not unusual for a roof design to call for slates that are thicker than standard production such as 3/8″ – 1/2″, 1/2″ – 3/4″ or even 3/4″ – 1″ or more. As you might guess, slate which is two or three times thicker than standard will usually be significantly more expensive. Q: I’m confused. I see “price per square” and “pieces per square”. What do you mean by “square”? The term “square” in reference to roofing materials refers to 100 square feet of roof area. One square of slate is the amount of slate that it takes to cover 100 square feet of roof area. A 10 foot x 10 foot section of roof would equal one square. So would a 4 foot x 25 foot section. Ditto for a 5 foot x 20 foot. You get the picture. The number of pieces required to cover one square is dependent on the size (or sizes) of the slate. The larger the slate, the fewer the pieces per square. It is acceptable to order in quantity by specifying either pieces or squares. Q: How do I determine the number of squares needed? Depending on the complexity of the roof, you may need to dust off your book of geometric formulas for this. With or without Architectural drawings, you have to compute, estimate or guesstimate the area of all the roof surfaces that will need to be covered. Those numbers, converted to square feet, are what you need. For example, if you figured 2000 square feet, you need 2000 square feet/100 square feet in a square = 20 squares of slate. A simple roof might be all rectangles (Area = length * width). There are often triangular sections to compute (Area = the base * height/ 2). Sometimes there are trapezoidal sections and less often, cones. Q: What tools do I need to work with roofing slate? Tools specific to the task include a slate hammer, a slate ripper and a slate cutter. A regular claw hammer will work, but lacks some of the features of the slate hammer, most notably, the “pick” or pointed end which is handy for punching holes in slate when needed. There are other ways to put holes in slate: drill them with a 3/16″ carbide drill bit, or punch them with a nail or punch. A mason’s hammer can approximate a slate hammer, but the “pick” should be ground finer to facilitate clean punching. The slate ripper, used for repairs, is absolutely necessary, even on a new installation. You WILL need one. If you don’t know how to use a ripper, then read “Slate Roof Repairs” by Les Gove. The slate cutter is the handiest way to trim slate. It’s fast, accurate and leaves the same tapered edge as the quarry slate trimmers. Again, there are other ways to cut slate, but if you don’t know what they are, then you aren’t experienced enough to employ them. Q: How is slate fastened to the roof deck? Most often with nails. We recommend #10 gauge smooth-shank copper nails for a normal installation. Normal meaning a nailable wooden deck. Copper nails are in keeping with a good slate roof’s longevity and the smooth shank is forgiving in those inevitable moments when you’ll be forced to pull a nail or use the ripper on one. There are other options, and sometimes engineering considerations such as a concrete deck dictate a different specification.